Please click here to exit. Qing River has no discernible natural source. 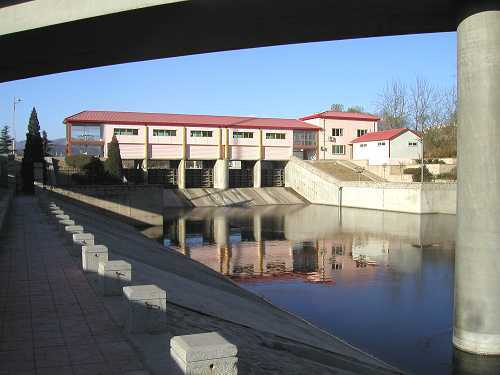 Its origin is simply the sluice port between Baifu Canal shown on these pictures. Even though being one of the four most important rivers of Beijing, Qinghe unceremoniously commences its journey and flows in a gentle curve towards north. The river flows under the heavily trafficked highway leading to a.o. the northern gate of the new Summer Palace (brown colored road sign). The smaller photo shows efforts to beautify the river. Note the construction of terraces for trees and flowers. The smaller picture was taken on a icy cold winter morning early December 2005 and looks northeast. 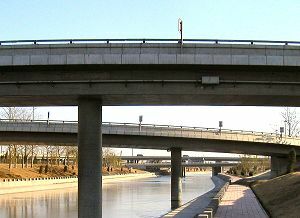 Qing River flows under Beijing's 5th Ring Road and immediately afterwards turns sharply onto an east-northeastern course. The next four kilometers the river runs parallel with- and just north of the ring road. The water at this section was frozen solid in the -10° windchilled cold air this December day 2005. The river continues its eastern flow and soon arrives at its first major road crossing (smaller photo). The larger photo looks back west at Beijing's western hills. It captures well the calmness of the water environment just a few feet away from the busy traffic. 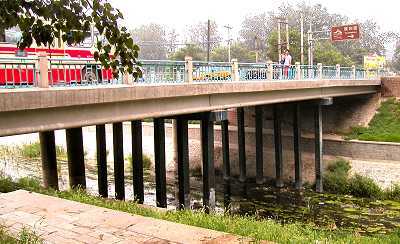 At the crossing of Yuan Ming Yuan Xi Lu ("Summer Palace Road West") the river meets its first water regulating sluice since its origin (larger photo). 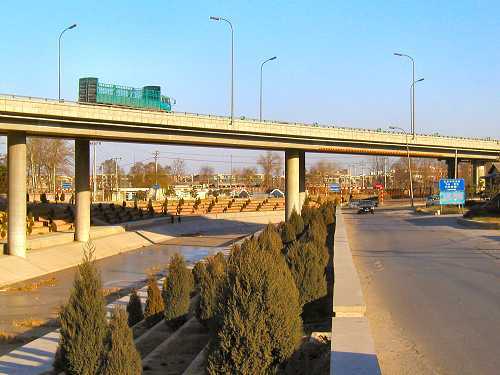 The smaller photo depicts Qinghe flowing under the spaghetti roadways of the entry/exit ramps of the ring road. 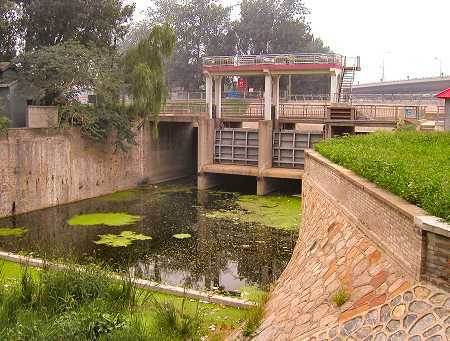 Qinghe now enjoys a regulated but quiet and curved flow all the way till the next water sluice (center background). 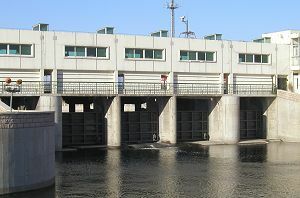 The smaller photo shows the east side of the sluice. A look back west at the sluice with the mountains as a backdrop. 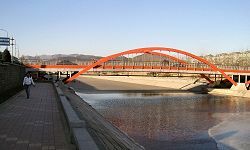 Eastward come two traffic bridges.